Sales Methodology = Expensive Failure. 7 Reasons Why & How To Avoid. If your sales methodology approach does not stack up in these 7 areas then you are potentially setting yourself up for an expensive failure. Is the traditional sales methodology dead? Over the lifetime of CloudApps, we must have discussed this topic with hundreds of sales leaders. Sadly, they pretty much all expressed dissatisfaction with the results gained from deploying a traditional sales methodology. We are not alone in this view. McKinsey & Company conducted a study reporting that 75% of solution selling efforts were considered failures after just 3 years. A rather stark and damning statistic. What is a sales process? These are the specific steps you follow to navigate from the point when a lead hits your business to the point that you achieve a closed/won deal. There are usually a handful of ‘stages’, with associated milestones, that help signpost progress along this path to success. This sales process and the stages within allow you to pull together a sales forecast. This forecast totals the value of the business that is likely to close at a future dated time. What is a sales methodology? Simply put, a traditional sales methodology outlines how you should go about executing certain steps within your process. There are many sales methodologies available on the market today, too many to document here. So why is this once popular approach failing to deliver on its promises? Increase the performance of your sales team today! What’s the problem we are trying to solve? Before we move on, let’s focus on the reason for having a solid sales process and sales methodology in the first place. Simply put, as sales leaders, we want all our reps to get to a successful deal outcome more often and faster. We crave a repeatable process that we can train everyone to follow, safe in the knowledge that it will create a sustained increase in sales performance. This desire is driven because we want to maximise the performance of our core sales team. On our distribution curve of sales success, we know that we don’t need to worry about the top 10% of sales performers. There is little to be gained here in terms of output. Conversely, we will most likely manage out the bottom 10%, as the continued investment will likely never reap a positive return. As a result, we focus our effort on gaining more from our core sales team. We know that the fastest way to improve sales performance is to get small percentage gains in the middle hump of our team. Why is the traditional sales methodology not working? The theory is solid. We have a core sales group from which we believe we can drive a performance enhancement. So why is it that the traditional sales methodology is not working? Let’s start here. Sales Methodologies are generic in their nature, they are not built with any CRM system in mind. As a result, the app built to capture the additional information required by the methodology is often separate to the CRM system. It has a different look-and-feel and doesn’t operate like a natural extension to the CRM process. If you thought it was hard getting reps to adopt your CRM system, spare a thought for the outcome that this will drive. Poor integration with CRM systems often means duplicated data entry, which we know sales reps love to do, right? OK, so assuming we can overcome the usability problem, next up is the approach taken to training. Firstly, training comes in the form of a mandatory service. This is odd to start with. Who knows your sales process better, the sales methodology vendor or you? The very notion that your sales process should fit the sales methodology has always struck me as the wrong way around. Training is delivered in a classroom style, well away from the hand-to-hand combat reality of selling. Consequently, the training is theory based and all too quickly forgotten when back in the real world, where old habits fast return. We have mentioned that these sales methodologies are generic in their nature. Developed over many years, they have layer upon layer of complexity that does not match modern sales techniques. We have moved on into an information rich environment where the buyer is a different beast to the one addressed when these methodologies were constructed. We have heard back from numerous sales leaders that have felt this pain. The outcome of this complexity restricts adoption to the top performers. These are of course not the target audience for this investment, it is the core performers that we want to improve. Traditional sales methodologies are quite rigid in their nature and dare we say a little dumb! They don’t flex and change with the rapidly changing business landscape. It is a one size fits all approach, not personalised to your business. The sales methodology doesn’t learn and adapt as you do and as a result can fast become out-dated. Often seen as a management tool by reps, they cannot see the value to them. Asking reps to fill out yet more information into your CRM system only compounds the adoption problem. This increased mistrust has its own side effects; an incomplete picture making accurate sales forecasts an impossible dream. Not so much a contributor to failure and more of a barrier to entry, the high cost of the traditional sales methodology remains out of balance with modern utility-based pricing. Steeped in the licensing model of the 80s & 90s this high cost makes any failure even more painful to take. It is also virtually impossible to measure the change that this weighty investment will deliver. What can we learn from this? Well, to really drive your sales process, you probably need to ask yourself these seven questions when seeking a sales performance acceleration solution. 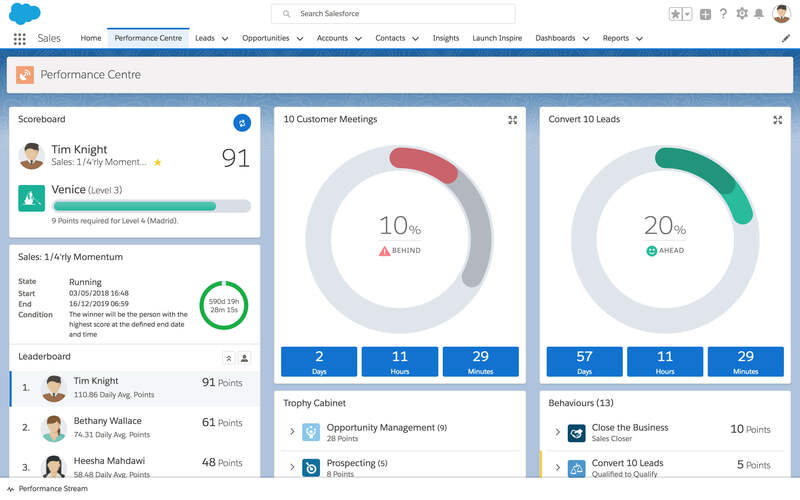 Is the tool you are about to invest in seamlessly integrated into the CRM experience? It should feel like a natural extension of your CRM platform if you want to remove the adoption barrier. Will the tool learn and adapt as your business changes and grows? The system should help you to learn from your top performers and adjust your sales process accordingly. As well as learning what “good” looks like, can it monitor what “bad” looks like and correct it? Can the solution measure change and prove its own ROI? Will it provide the tools for every sales manager to have a productive individual deal health and overall pipeline coaching with their reps? Finally, will the chosen solution help reps to realise that the CRM system, sales process and methodology are personal productivity and effectiveness tools by making it competitive across the whole process? If your selected sales acceleration approach does not stack up in these areas, then you are likely setting yourself up for failure. then the investment will most likely fail. Remember, the golden goose that laid the golden egg managed to do so because a 5% performance increase in middle-ground sales reps yields over 70% more revenue when compared to a 5% shift in top performers productivity. Finally, it’s worth pointing out that these are only some of the ways to increase sales performance. There are many more secrets to getting the most from your existing sales team. If you’re hungry for a little more sales performance inspiration, we’ve got this eBook with 6 sure-fire ways to increase the output of your sales team.